Tableau Prep - Perception Consulting Ltd.
Tableau Prep empowers more people to get to analysis faster by helping them quickly and confidently combine, shape, and clean their data. 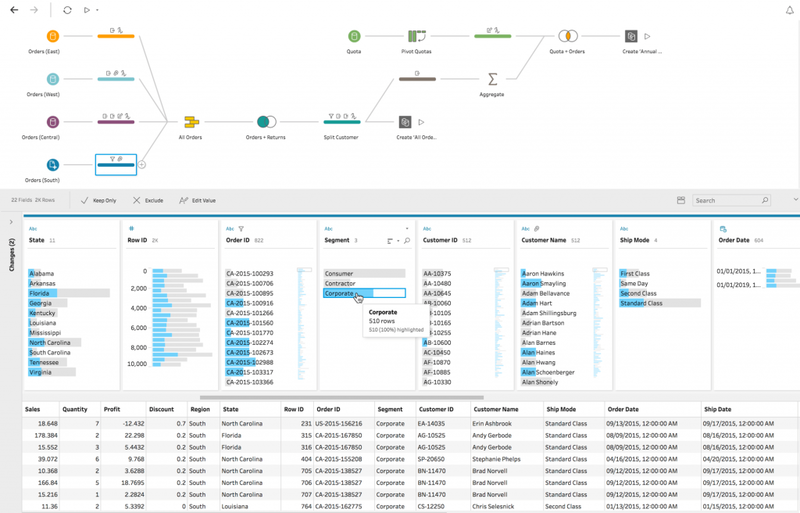 A direct and visual experience gives customers a deeper understanding of their data, smart features make data prep simple, and integration with the Tableau analytical workflow allows for faster speed to insight. Three coordinated views let you see row-level data, profiles of each column, and your entire data preparation process. Pick which view to interact with based on the task at hand. Use smart features to fix common data prep challenges. Tableau Prep employs fuzzy clustering to turn repetitive tasks, like grouping by pronunciation, into one click operations. Stay in the flow of your analysis. It’s easy to open your output with Tableau Desktop or share it with others via Tableau Server or Tableau Online. Easy sharing reduces friction and helps you bridge the gap between data preparation and analytics, for better business results.